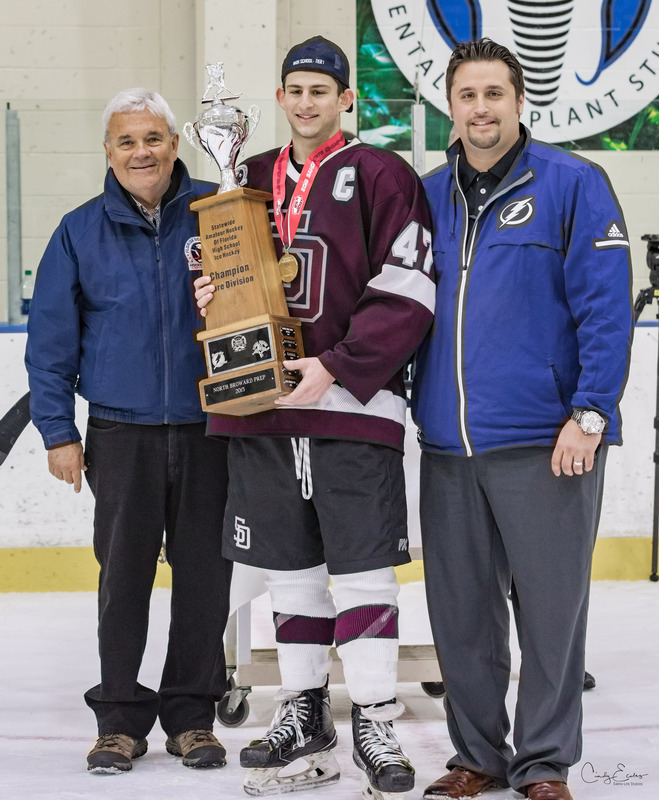 The 2018 Statewide Amateur Hockey of Florida (SAHOF) High School State Championships took place in Germain, Florida at the Germain Arena over the weekend of February 23, where 10 teams competed for either the SAHOF Tier I or Tier II State titles. 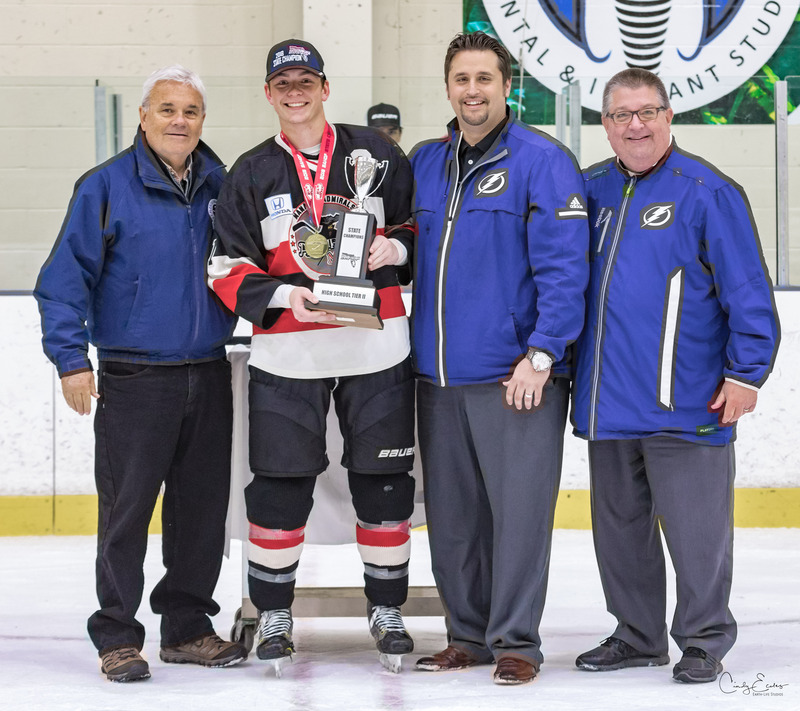 The Tier I group consisted of four pure High School Hockey teams (East Lake, Jesuit, North Broward Prep & Stoneman Douglas), and the Tier II group entailed six combined High School Hockey teams (Bloomingdale, East Manatee, Plant, Miami Dade, Southwest Broward & Westside). Each team played in three Round Robin games in order to determine the seeding for each respective Tier’s Semi-Final and Finals Round. After the Round Robin series of games, the Tier I Pure Division saw the LHSHL’s East Lake Eagles finish in first place (3-0-0-0—8pts) and the Jesuit Tigers in third place (1-0-0-1—4pts). That left North Broward Prep finishing in second place (2-1-1-0—5pts) and Stoneman Douglas finishing in fourth place (0-3-0-0 –0pts). However, it was the winless Stoneman Douglass Eagles that eventually rallied back and won the Tier I 2018 SAHOF High School State Championship. While Stoneman had lost to East Lake by a score of 5-4 on day two of the tournament, the battle of the Eagles belonged to Stoneman on Championship Sunday. Stoneman defeated East Lake 3-1 in the Semi-Finals, and advanced to the Finals. On the other side of the Tier I Semi-Finals bracket, the Jesuit Tigers took to the ice against North Broward Prep. Jesuit had lost to North Broward 6-4 on day two of the tournament, but similar to the Stoneman-East Lake matchup – it was the underdog that walked away victorious. The number three seed in Jesuit stunned North Broward prep after the Tigers defeated the Tier I two seed by a score of 4-3. The Tier I Championship was then set, and to a surprise it was the three and four seeds playing against one another for the State title. Stoneman Douglas wasted no time making a statement, as the Eagles got on the score sheet early and often. Stoneman found the back of the net on four occasions to open up the game during the first period, and held Jesuit off of the score sheet until the latter stages of the second period. The LHSHL’s Tigers would score two goals late during the second period, and also added in another two goals during the third period. Yet, it was too little too late. Stoneman Douglass ended up defeating Jesuit by a final score of 7-4 and the team celebrated an emotional Tier I State Championship title. 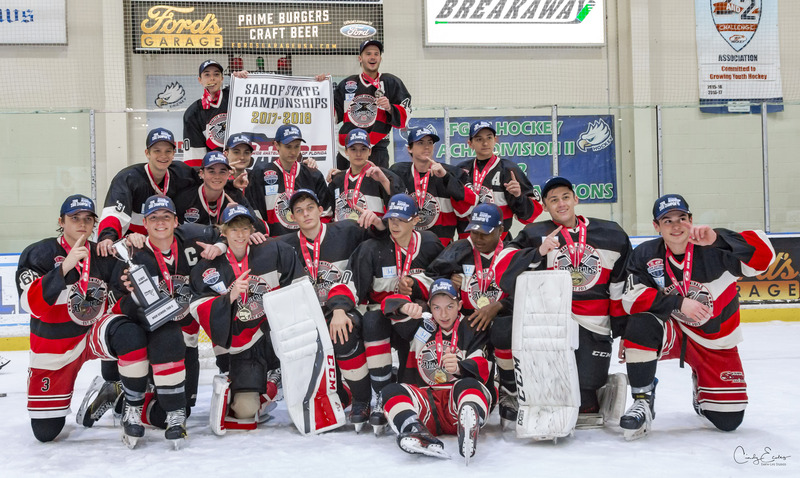 Keep in mind that both teams who advanced to the Tier I Finals also received an automatic bid to the Nationals, which will be played in Plymouth, Minnesota from March 22 until March 26. Out of the six teams that competed in the Tier II bracket, four (top two teams from each bracket) would advance to the Semi-Finals. In the LHSHL bracket, the East Manatee Admirals finished in first place (2-1-0-1—7pts) and the Plant Panthers followed in the second place (2-1-0-0-6pts). The two LHSHL teams would then face-off in the Semi-Final round, but it was East Manatee that won in convincing fashion. The Admirals shutout the Panthers by a score of 6-0 on Championship Sunday, and then advanced to the Finals to take to the ice against Miami Dade. East Manatee and Miami Dade kicked off the 2018 SAHOF Championships with the tournament’s first scheduled game, and the contest’s outcome set the standard high moving forward. In the first meeting the two teams skated to a 4-4 tie during regulation, and fans then witnessed the tournament’s first shootout. Keep in mind that since there was no overtime frame during Round-Robin play, the two teams went directly to a three-man shootout. Though, it was Miami Dade that skated away with the victory; which also gave East Manatee its first loss in almost two months. Still, when the teams took to the ice for the Tier II Championship it was a much different outcome. The Admirals skated to a 6-1 victory over Miami Dade and East Manatee wasted no time getting on the score sheet early, either. Admirals forward Jackson Bennett opened up the scoring with two breakaway goals, which may have stood as the key momentum swing for the contest. While East Manatee and Miami Dade both recorded a goal each in the second period, the Admirals shut the door on Miami in the third period and also chipped in three goals. Peter Morgan had the third period’s first two goals, and of one of which came shorthanded. Morgan led the tournament in goals with 18, and points (18G-4A—22pts). Overall, East Manatee outscored its opponents 39-7 en-route to its State Championship during the tournament, and two East Manatee players ended up as Tournament Statistics Leaders (Morgan; & goaltender Tyler Moschella).